In 1995, we sold off our van and bought an old, small little Datsun to use. The proceeds of the sale were used to finance Allan’s exploratory trip to USA before we ventured into the entertainment business. In the years to come, we bought bigger vehicles for our “growing” family (The children were growing) and to accomodate the business’ needs. Although the cars came and went, we kept the old little Datsun. It was useful as an extra car whenever our staff needed one. 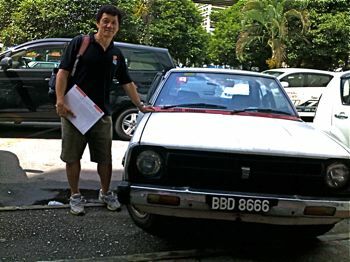 Later, we sold it to Ah Hui for RM1,000.00 but he didn’t want to transfer the ownership of the car to his name – it was just too complicated for an old car as far as insurance was concerned. 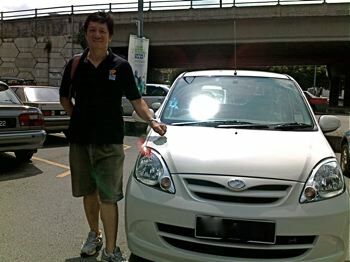 When he went back to Miri after about 6 years with us, he returned the car to us. Although the car was literally falling apart (erm, I shall not mention who was responsible, ha ha ha), it was still running alright and was still used! Last month, we found out that we could surrender the car to be scrapped and get paid RM5,000.00 for it in exchange for purchasing any Perodua car. So we decided to end its life *appropriate music comes in here*. What have we learnt from this car? So, although the Datsun was not a handsome or expensive car, we felt it deserved a place in our blog. This car started together with us in the business and has a special place in our hearts. Farewell, BBD 8666, may you rest in peace. Thank you for your services and we are proud of you.